Chicken !, originally uploaded by WelcomeToTheDoghouse. Flying Una!, originally uploaded by WelcomeToTheDoghouse. You are now free to move about the country, Eva H.
Successful take-off courtesy of custom pet portrait artist and photographer WelcomeToTheDoghouse. Snort! I do this to my dog all the time - she looks equally unsure of what to make of it. I love the eyes closed/blissful look of the second picture. Must have caught a really good up-draft. I think this is one the cutest ones yet. When I opened up the page I actually said, "oooooh" out loud. YOU ARE DAH WIND BENEEF MAH WIIIIINGS! /No, seriously --- one blue, one brown. SHE's got David Bowie eyes. I like his different googly eyes! And his practically hairless pink skin. Hilariously cute! Makes me think of "Kiwi." As a fan of Bowie, I am aware of his eye condition, but the protective contact lens he wears gives the appearance of one blue + one brown. I was being, like, tewtally superficial here. /I doubt this lovely pooch dances in the moonlight, the serious moonlight. How many legs does that cutie have? That dog has the trickest eyeball ever! It looks like it's a blue ring around a brown center! What an awesome portrait! Doctors could not fully repair the damage, leaving his pupil permanently dilated. As a result of the injury, Bowie has faulty depth perception. Bowie has stated that although he can see with his injured eye, his colour vision was mostly lost and a brownish tone is constantly present. The colour of the irises is still the same blue, but since the pupil of the injured eye is wide open, the colour of that eye is commonly mistaken to be different. Bowie SEES brown out of that eye. Aww that pup looks so happy, he's smiling! Have no fear, Super Pup is here! Nobody knows why bumblebees can fly- and now, the question is reopened about how bulldogs can fly, I smell dissertation! Ah b'leeve Ah kin flah! That reminds me, I need to make an appointment for a pedicure. Maybe I can take this little girl with me and we can make a day of it at the spa! AWWW!!! This doggy wants to fly!! I LOVE the second pic.. too cute!!! 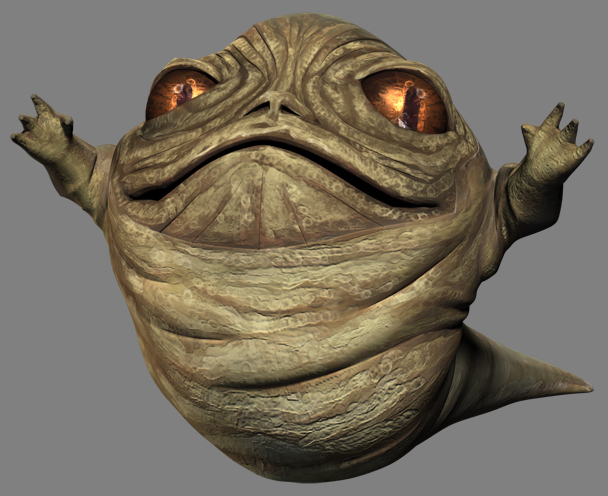 "I'm King of the World...woo-hoo"
Its Rotta the Hutt! From the clone wars movie I was forced to sit through! The second picture just makes it. Eaglie, I thought of the kiwi too with that blissful 2nd pic with eyelids at half mast. So happy to finally be airborne! School "Shop" teacher, Mr. Groszko. Not only are the eyes different colors, but they are scanning in different directions. An important safety feature for flying dogs. I can almost see those jowls flappin' in da wind!!! think of sleigh bells Here we go! You can fly! You can fly! 2nd photo is AWESOME! Yay for flying dogs! However, Jane Seymour really does have one blue eye and one brown eye. Couldn't help myself. That's what I immediately thought of! Kris - OK, you've chosen a good piece to work with... now rewrite it for Una. Teho - I will have to address that this afternoon - work suddenly became WORK! HMPH! Back laters! "I ain't got no body, and nobody cares for me. Yakka tak ta a yakka tak ta ha!" My cousin was BORNED with one blue eye and one brown, so there. But he does not possess the Marty Feldman bidirectional gaze. 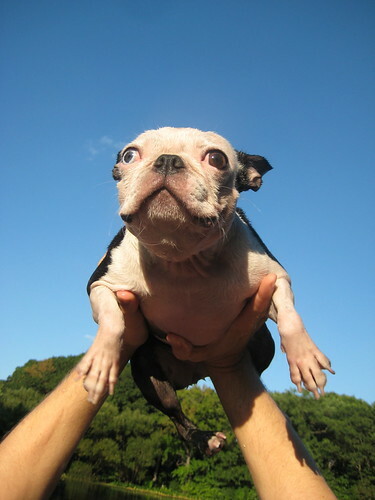 @Biscuithead-- So just change the lyrics to "She's got Marty Feldman eyes." The first picture looks like Pink Floyd's "Learning to Fly" - "my sole intention/is learning to fly!/Condition grounded/but determined to try." And the second picture looks like Talking Heads "And She Was" "And she was moving very slowly/rising up above the earth/moving into the universe/drifting this way and that/not touching the ground at all/up above the yard!"